6 Massive Buildings Which Were Never Built! The Volkshalle(”Hall of the People”), was a monumental domed building planned and designed by Hitler’s architect Albert Speer. It would serve as a grand architectural centerpiece for Hitler’s new world capital, Welthaupstadt Germania. However, this project was never accomplished. If it was ever built, it would dwarf every other structure in Berlin. The Volkshalle‘s monstrous dome was projected to rise from a massive stone podium 1,033 by 1,033 ft(315×315 m) and 250 ft(75 m) high, to a total height of 950 ft(290 m). It was designed to have a diameter of more than 820 ft(250 m). Inside the Volkshalle, there would be a massive apse, covered with gold mosaics and enclosing a giant silver statue of eagle 80 ft high, beneath which would be situated Führer‘s tribunal. From here, he would be able to adress more than 180,000 people, seated in three tiers of seats enclosing a giant circular arena, 460 ft(140 m) in diameter. At the very top of the dome, there would be a giant oculus, 150 ft(46 m) in diameter, that would easily accommodate the entire dome of St.Peter’s Basilica in Rome. The Volkshalle was never built. Many experts claimed that such a large granite dome was structurally impossible. There were also other severe architectural problems, such as acoustics, that would either make it impossible for anybody to hear the speaker, or magnify his voice to a deafening volume. Albert Speer speculated that during the winter, the breathing and perspiration of more than 100,000 people inside such a large closed space might precipitate and fall back down. In short, it was possible that the hall might have a weather of its own, sometimes resulting in indoor rains. Similarly to Nazi Germany, the Soviet Union was also known for their monumental architectonic projects. The largest and most gigantic of them, the Palace of the Soviets, was a planned congress hall and administrative centre to be built in Moscow, near the Kremlin. The 1,362 feet (415 m) high palace was to be crowned by a monumental statue of Vladimir Lenin, 260 ft(80 m) high. The area of the building was to be more than 11 hectares, and the entire Palace of the Soviets would weigh more than 1,5 million tons. The Main Hall, located in the center of building, would have a capacity of more than 21,000 seats, being more than 525 ft(160 m) in diameter. The gigantic bronze statue of Lenin would weigh more than 6,000 tons, and a library would be located inside of its head. In the year 1931, the symbol of old Russia – Cathedral of Christ the Savior was demolished to clear the place for the Palace. In year 1937, the foundations were laid and construction of the steel frame started. However, after Adolf Hitler’s invasion to Russia, lack of material and manpower halted the construction for several years, and its steel frame was disassembled to be used in fortifications and bridges. After the war, the project was abandoned, and foundations of the Palace of the Soviets were converted to the world’s largest open-air swimming pool – the Moskva Pool. In the year 1995, the pool was destroyed and the full-scale replica of Cathedral of Christ the Savior was restored on the same foundations. 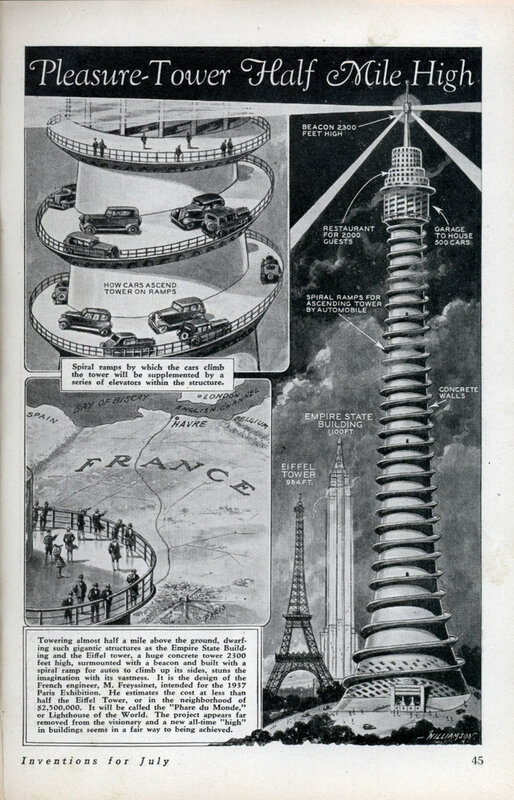 Originally designed for the 1937 World Fair, the Phare du Monde was a 2,300 ft (701 m) tall observation tower proposed to be built in the outskirts of Paris, being only tower in the world fully accessible to cars. It was designed by the French engineer Eugène Freyssinet, and often advertised as a ”Pleasure Tower Half Mile High”. It was designed to be built entirely from concrete, with a 3,5 miles long spiralling road on the outside of the building, all the way to the parking garage for 500 cars at the top.The costs were estimated to have been a mere $2.5 million($41.9 million after adjusting the inflation), however, the tower was never built. This giant, surreally looking tower was designed back in 1919 by a Russian architect Vladimir Tatlin.Planned to be erected in Leningrad(now St.Petersburg), the Tatlin’s Tower would serve as the headquarters and monument to the Third Communist International. The tower was planned to be built only from industrial materials: iron, glass and steel, as a symbol of modernity and architectural constructivism. Its main form was a double helix, spiraling up to the height of 1300 ft(400 m). Visitors would be transported around using various mechanical devices. Main framework of the building was designed to contain four major geometric structures, rotating at different rates of speed. First of them, the cube, would be located at the base of the building. It was designed to be a venue for various conferences and meetings, and would completely rotate after one full year. On top of the cube, there would be a small pyramid containing executive facilities, making one full turn every month. There would be also a cylinder housing an information centre and news facilities, rotating every day, while the entire structure of the tower would also make one full turn once a year. Needless to say, it was never built. The Illinois was a one mile(1,600 m) high skyscraper proposed in 1956 by Frank Lloyd Wright himself. If it had been built, it would have been the tallest building in the world, four times taller than the Empire State Building, twice as tall as the Burj Khalifa, and even taller than the Kingdom Tower, which is currently under construction, and will be be at least 3,300 feet(1,000 m) tall when finished. The Illinois‘s design, intended to be built in the center of Chicago, included 528 floors, with a gross area of 18,460,000 square feet (1,715,000 m2). Frank Lloyd Wright stated that there would be also a parking space for more than 20,000 cars and 180 helicopters. There would be 76 elevators, each being five-floor-high. The elevators would be divided into five groups, with each of them serving a hundred-floor segment of The Illinois, while reaching speeds of more than 60 mph. The highest floor would be accessible by spiral staircase, and served only by one elevator. Most of the tower’s 528 floors would be used as office space for government and private companies. The top 9 floors would be TV studios, and The Illinois would topped off by a 330 ft(100 m)tall antenna used for nationwide broadcasts. However, this skyscraper was never constructed. Although it would have been structurally and technically possible to build such a building even at the time it was proposed, the price tag would have been immense, and there were still too many unsolved problems, as possible wind oscillation and fire precautions. 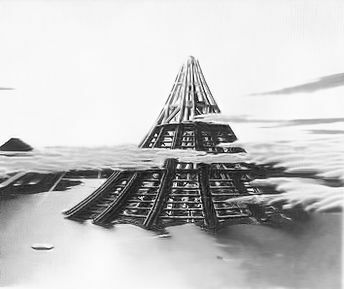 The X-Seed 4000, is often considered the tallest structure ever fully envisioned. Designed by architect Peter Neville in year 1995 for the Taisei Corporation, it was proposed to be built near the coast of Tokyo, Japan. It was projected to rise to a total height of 2.5 miles(4 km), even higher than the Mt. Fuji, with its sea-base being 3.7 miles(6 km) wide. With its 800 floors, it could accommodate more than one million inhabitants. This massive structure was projected to be built using over 3,000,000 tons of reinforced construction steel. Some estimates say that the possible price tag to construct this structure may be somewhere between $579 billion–$1.04 trillion in 2014. Due to its immense height, the X-Seed 4000 would be required to actively protect the inhabitants of its higher floors from air pressure variations and weather fluctuations. As it was planned to be built on the Pacific Ring of Fire, it would be also often subject to devastating earthquakes and tsunamis. However, the X-Seed 4000 was actually never meant to be built. The sole purpose of the project was to earn some worldwide recognition for the Taisei Corporation, and it worked.